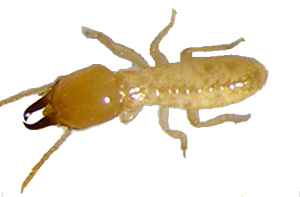 Subterranean termites are a lot trickier than their better known counterpart the dampwood termite. Subterranean termites go largely unnoticed due to the fact that they live underground. Being that they are around wood, they tend to get mixed up with the carpenter ant, but unlike the carpenter ant, termites actually consume the wood instead of only using it as a nesting site. Subterranean termites live underground and typically will emerge in early spring to late fall to feed on the substructure of your home from the crawl space. The galleys/tunnels the termites make have unique characteristics, so much so that they got their own nickname, Mud Tubes. Subterranean termites consist of 3 types, the alates (swarmers), workers and the soldiers. The swarmers are dark brown to black with 2 pairs of wings that are almost exactly the same length in size. The workers have no wings and are cream colored. Lastly the soldiers have no wings as well, but have large mandibles (like jaws). The soldiers are creamy white with a brown head and are the defenders of the colony. The warm temp and heavy rainfall trigger established colonies to send out a swarm of winged termites, male and female, to find a suitable home for a new colony. Once found, male and female will pair up and shed their wings into a pile then find a piece of moist ground to make a chamber in to lay eggs and start a new colony. In this chamber, they will seal themselves in to make sure that no intruders may enter. They then grow as a colony until it’s time to start another and the process repeats. Damaged wood from subterranean termites will break easily, so you can imagine if they get ahold of any support beams or any beams in your crawl space or in your home it can cause some serious damage. Termites cause billions of dollars in damages every year. If you suspect you have a problem, it’s important to get it checked out soon. How Can I Prevent Termite Damage? Having checkups in your crawl space is a great way to find out if you have a problem. Making sure your crawl space is dry all year round will help as well. Bloom is here to help. We offer free termite inspections and are more than willing to work around your schedule. If you fear you have termites, don’t hesitate to call.